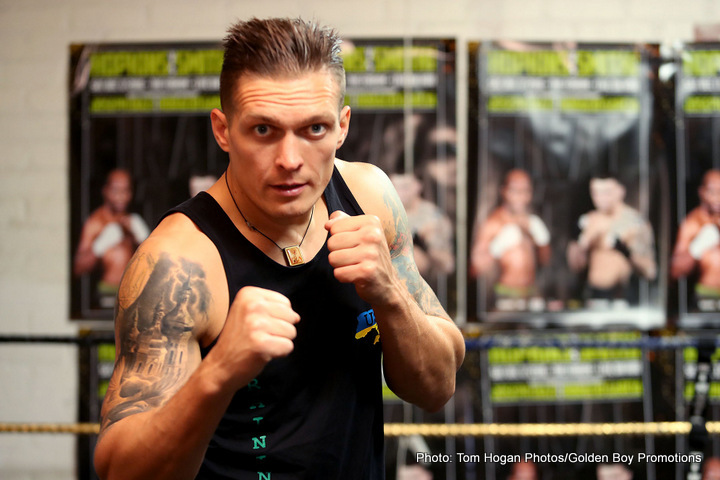 WBO World Champion Aleskandr Usyk on Marco Huck, tactics and Muhammad Ali ahead of the World Boxing Super Series premiere on September 9 at the Max-Schmeling-Halle in Berlin, Germany. You picked Marco Huck as your opponent in the World Boxing Super Series. How would you describe him? How do you prepare for Huck? What do you think of the idea of the World Boxing Super Series and the Muhammad AlI Trophy? Aleksandr Usyk’s trainer Sergey Vatamanyuk talks of great respect about Marco Huck before the Ali Trophy quarter-final clash at the Max Schmeling-Halle in Berlin, September 9. How do you prepare for the fight against Huck? “We try to understand what we need in that fight in order to win. We practise some things and we watch videos of Huck’s fights. It will for sure be a good fight for the fans. Huck has defended his title 13 times, ‘Sasha’ is a world champion. Your fighter is seen as the favourite to win The Muhammad Ali Trophy. Do you agree? “I don’t like to talk about who is the favourite in this tournament because this is the cruiserweight division and one punch can decide everything. I don’t like to talk about favorites. How is it to train Usyk? The World Boxing Super Series is delighted to announce that the inaugural season of the Muhammad Ali Trophy will feature ALL four reigning cruiserweight champions. WBO titlist & Olympic gold medal winner Oleksandr Usyk (12-0, 10 KOs) has officially joined the revolutionary bracket-style elimination tournament that already features unbeaten champions Yunier Dorticos (WBA), Mairis Briedis (WBC) and Murat Gassiev (IBF) as well as former champions Marco Huck and Krzysztof Wlodarczyk, with two more spots to be filled. On July 8, all participants will come face-to-face at the Draft Gala in Monaco where they will hand-pick their quarter-final opponents. The World Boxing Super Series is delighted to confirm the next star participant for the cruiserweight competition. Former WBO World Champion Marco Huck (40-4-1, 27 KOs) has joined a star-studded tournament line-up that already features the undefeated and reigning world champions Murat Gassiev (IBF), Yunier Dorticos (WBA) and Mairis Briedis (WBC) as well as former world champion Krysztof Wlodarczyk. Starting in September, eight of the world´s best cruiserweights will battle it out in a revolutionary bracket-style elimination tournament for The Greatest Prize in Boxing, the Muhammad Ali Trophy. Huck has been a major player in the cruiserweight division for many years, tying the record for the most title defenses (13) before losing to Kryzsztof Glowacki in August 2015. He bounced back with convincing victories over Ola Afolabi and Dmytro Kucher before falling to WBC kingpin & fellow World Boxing Super Series participant Mairis Briedis earlier this year. In the inaugural season of the World Boxing Super Series, 16 elite fighters – eight super-middleweights and eight cruiserweights – will battle out a bracket-style elimination tournament. In both divisions, there will be four quarter-finals (September / October 2017), two semi-finals (early 2018) and one final (May 2018), making for a total of 14 high-class fights. The tournament bracket will be determined during the Draft Gala in Monaco on July 8. Next boxing news: So who came closest to beating Floyd “Money” Mayweather? Fight fans in total agreement, for once!